Can you feel your wallet digging into you each time you sit down or walk down the street, chances you have found yourself here because you are searching for a solution to that problem. Slim wallets are still number one when you are looking to de-clutter what you carry around with you on a daily basis. Each slim wallet comes in a different shape or size, we have found and reviewed the best slim wallets out on the market. From Leather to fabric to metal to old fire hose material we have it here. The Vaultskin Manhattan slim wallet is crafted from the finest Italian leather, featuring a bifold design that protects your cards and cash from the elements. The Manhattan wallet offers storage for up to 9 cards, with the innermost pockets protected by RFID blocking insulation. This insulation provides you with invaluable protection from electronic identity theft. Designed with US dollar bills in mind, this bifold slim wallet can hold both cash and cards, while maintaining a small footprint in your pocket. Bifold wallets are traditionally not as slim as single-fold designs, but the Manhattan is still a very slim wallet. 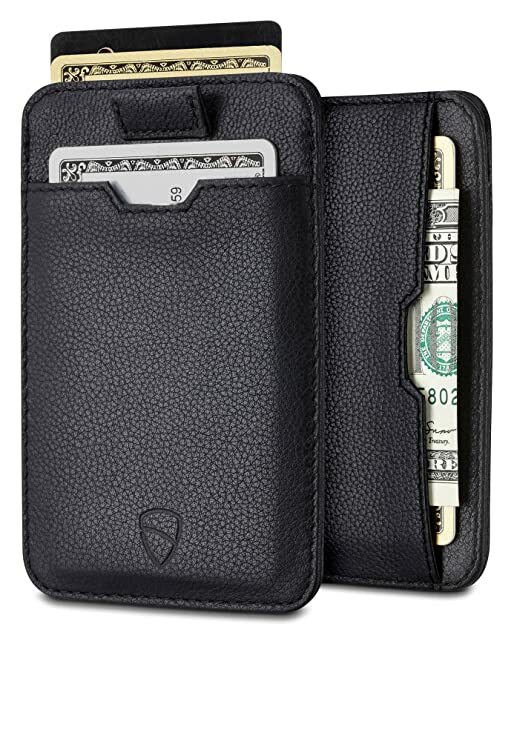 With space for numerous cards and cash, and RFID protection, it’ll make an ideal replacement for your regular wallet. The Roco slim wallet is just that; a very basic, RFID blocking wallet, which has been designed with cards and bills in mind. You won’t fit coins in this slim wallet, that’s for sure. Designed for a selection of credit, debit or ID cards, this slim wallet features toughened rubber bands to hold everything in place. It also comes in a range of over 10 designs, including basic shades, as well as interesting camo effects. This wallet isn’t for you if you like to carry around a fistful of coins, but for cards, it’s perfect. The range of design options means you’re getting something that stands out from the usual crowd of leather or fabric wallets. This is a slim wallet made from genuine leather, but one that still retains the look and feel of a traditional design; this wallet is well suited for cards, cash and bills. Despite its slim stature, this wallet still manages to pack a large amount of space inside, with 7 card compartments and 2 flip-up ID windows. All of this is supplemented by RFID blocking insulation to safeguard your identity. Unlike other slim wallets, there’s plenty of space for coins as well as bills. If you’re after a slim wallet but don’t want something completely different to your usual style, then this design meets you in the middle, without sacrificing on carry space. If your primary concern for a wallet is to carry a small selection of cards and bills, then this is an inexpensive and eco-friendly option. Though thicker than single-fold wallets, bifold designs provide more space for your cards rather than bundling them all together. This slim wallet features 3 card compartments, with a cash pocket and identification window, providing just enough space for the essentials, while maintaining a small stature. If you don’t have a great deal to carry with you and want a slim wallet that’s not going to leave a bulge, then this may be the perfect choice. The synthetic leather design is suited to anyone conscious of their carbon footprint, too. This slim wallet swaps fabrics for metals, with the benefit of being one of the slimmest wallets around. The result is a tiny footprint in your front pocket. If you’re looking to break away from the traditional wallet, this aluminum design might be just the thing you’re after. Ditching the usual polyester or leather fabrics, it is entirely constructed from lightweight metals, while comfortably maintaining space for around 6 or 7 cards. However, it’ll take some practice to get used to removing the cards. If you’re not fussed with carrying around a genuine leather wallet, then it’s worth trying out a lightweight aluminum alternative. It’s best not placed in your rear pocket, but will fit comfortably in the front. A well-crafted leather wallet with RFID-blocking technology, which comes in a wide range of colors and designs. At 4 x 3 inches, it’ll slip comfortably into any front pocket. This slim wallet has the appearance of a fabric model, despite being crafted from 100% carbon fiber leather. Its 3 card slots are supplemented by an additional 2 larger compartments, which can be used for extended card storage, or filled with bills. Some additional storage space would be appreciated, though its relatively small price tag makes this a minor niggle. In this instance, NapaWalli have created a durable, carbon fiber leather wallet that won’t leave a dent in your pocket, though it could benefit from some additional capacity. If you want a slim wallet which emphasizes cutting back on unnecessary space so that you can save room in your pockets, this is a great slim wallet to consider. This one weighs less than an ounce and can hold cash as well as 4-10 different cards. When you compare this wallet fully loaded with a standard one, there is no competition on size. This slim wallet will help hide your wallet in your own pocket so that it cannot be easily seen by pickpockets. This Radix one slim wallet can carry both cash and cards, and is the perfect slim wallet for somebody who wants their wallet to take up a lot less space than a typical standard wallet. This slim wallet is for anybody who wants to get a great deal on a slim wallet which will easily last long enough to get what you pay for. With a simple design that is considerably durable, this is a great minimalist wallet for anybody to consider. At one of the most affordable prices possible, this is a minimalist wallet that anybody with a smaller budget should take a look at. Although it may not have RFID-blocking technology, it has a decent amount of storage and can be easily hidden away when not in use. With many different colors and options available, this Raw Threads slim wallet is great for anybody who is on a tight budget and simply wants a slim wallet that is affordable. This slim wallet is great for anybody who wants a wallet to be small and easy to put in your pocket. With the ability store 4-8 cards and clip on your cash, there is no reason to have one of those bulky wallets anymore. Slim wallets like this can store just as much as many other standard wallets and are considerably easier to hide. This isn’t your everyday slim wallet. This one here is constructed of decommissioned polyester fire hose materials and is considerably attractive in design. They come in many different colors and designs to choose from. Since this minimalist wallet is made with recycled fire hose and comes with many different designs to choose from, it is a great product for anybody to consider who might want something a bit more unique. This slim RFID wallet from SERMAN BRANDS is both slim and RFID-blocking so that can both easily hide your wallet and protect your cards from thieves. With a photo ID window and the ability to hold 6-8 other cards while keeping them protected from RFID signals, this is a very slim wallet which is both easy to hide and protect. It also has an attractive leather design which resembles a standard wallet. This Serman brands wallet comes in many different colors for the leather, and a 12-month warranty from the manufacturer to ensure that you are happy with your purchase. Just keep in mind that there are lower-priced slim wallets like this one on the market. This slim RFID wallet has one of the greatest number of features for such a very slim wallet. It comes with a lifetime warranty from the manufacturer, and is made with both leather and stainless steel. This wallet is RFID blocking, and can hold 3-10 cards and 1-5 bills. Considering how durable it is, this will last an extremely long time for anybody who only needs to store a few things in their wallet. Although this Trayvax Element wallet is definitely not the most affordable slim RFID you will find, it comes with a lifetime warranty and an extremely durable design which incorporates both metal and leather. It even has a bottle opener added to to it as an extra added bonus. This slim RFID wallet has the ability to help protect your identity and keep up to 10 cards safe inside. Both RFID-blocking and small in size, this is a great minimalist RFID wallet to consider. With a slot to store business cards, cash, and up to 10 cards in total, this slim wallet is a great option for anybody who wants a reasonably priced slim wallet which can be easily hidden away from potential thieves. If you want to store numerous cards and get a high-quality slim wallet which can block RFID signals, this Vaultskin Chelsea slim card sleeve wallet is one of the best options for you to consider. With a nice balance of space and affordability, this is the slim wallet for anyone to consider. I definitely wanted to develop a quick note in order to thank you for those fabulous items you are placing on this website. My time-consuming internet investigation has finally been compensated with awesome concept to share with my best friends. I would believe that many of us site visitors are extremely lucky to dwell in a great site with very many special individuals with good ideas. I feel very lucky to have seen your web page and look forward to tons of more exciting minutes reading here. Thanks again for a lot of things.